We have to be honest with you, Baselworld 2019 has been a bit of a washout when it comes to smartwatches and other high-tech wearables. In recent years this previously traditional watch and jewelry show has seen brands embrace technology, unveiling hybrid watches and even full-blown smartwatches alongside traditional timepieces. 2019 has been a lot more of the latter than the former, but there are still some smartwatch announcements you'll want to know about from Baselworld 2019. Below we talk through seven developments from Baselworld that you should care about, including new watches, new designs and updates from the world of smartwatches. Fossil unveiled new smartwatches at Baselworld 2018, but the company now seems to be focusing on IFA and CES for its core announcements in the Wear OS space. That didn't mean the company skipped Baselworld 2019 entirely though, as it unveiled new traditional watches alongside four new hybrids. We say they're new, but these are really new watch designs (under the Fossil and Skagen brands) that feature Fossil's usual hybrid tech. That means all four of these watches come with step tracking, sleep monitoring, limited notification support and more. The two new Fossil-branded watches are called the Cameron and the Jacqueline, and they offer new designs that are small, slim and unique-looking. 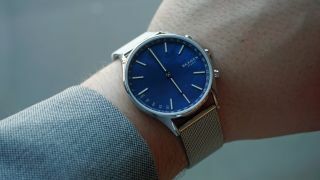 Two new looks for the Skagen Holst (a watch designed by Fossil) can be seen above too. One features a metal chain link band in black, while the other has a Milanese loop band with a mother of pearl watch face. You should be able to buy these from later in the year, but so far we don't have exact release date or pricing information for either. Fossil Group has a variety of brands under its banner including Skagen, Michael Kors and Emporio Armani. Two of the newest brands to join the wearable group are Puma and BMW, and previously Fossil Group has confirmed that it's working on ideas for smartwatches for each brand. Baselworld didn't see Fossil unveil its first attempts at smartwatches for either brand, but BMW has now debuted its first range of traditional watches, so it may be that the company is gearing up for a Wear OS makeover. We may not hear anything about this for quite some time though, as Fossil was unable to give TechRadar any firm dates or information when we asked about smartwatch plans. The new Tag Heuer Connected Modular 45 Golf Edition is a reworking of the company's high-end Tag Heuer Connected Modular 45 smartwatch, and its designed specifically for you to wear on the green. As well as Tag Heuer's normal mapping technology, it comes with a golf app to give you details on over 39,000 golf courses around the world. There are some slight design changes here too, but if you already own the Connected Modular 45 you probably won't want this. The new golf app from Tag Heuer is available for its existing Connected Modular 45 models as well as the Apple Watch, so unless you're looking specifically for the look above you probably won't want to spend $1,850 / £1,600 / AU$2,650 on one. Alpina seems proud of its AlpinerX adventure watch, and rather than properly updating it for 2019 the company has instead brought out new designs and introduced an added feature. The four new variants of the Alpina AlpinerX come with a heart rate tracker, as well as the new looks you can see above. Those new looks were the most popular combinations people made on Kickstarter last year, and each will be available for $995 (around £750, AU$1,400) later this year. You can see the full collection in the gallery above, but all the same adventure features such as a UV monitor are still here on the latest versions of the watch. The Skagen Falster 2 Wear OS watch has been on sale for a while now, but the company wants to inject its look with some bold colors for anyone who likes that style. Later this year, you'll be able to buy the Falster 2 with four new straps that come in yellow, red, green or blue. Exactly when you'll be able to buy these is unclear, but they'll certainly give your watch a different design to the more traditional straps Skagen normally uses. You may have heard about the Michael Kors Access Sofie 2.0 which was announced at CES earlier in the year. It isn’t on sale yet, but the watch is now confirmed for an April 2019 launch in a variety of markets around the world. As well as it coming soon, we’ve now been told it will have a slightly different name. Instead of the name Access Sofie 2.0, you’ll be buying the Michael Kors Access Sofie Heart Rate. That's a long, complicated name but at least it's clear what the main addition is. And finally, Casio has just unveiled a new version of the WSD-F30 Wear OS watch. It has all of the same tech as last year's smartwatch, but it sports a new unique design. Casio only plans to make a thousand of these so they may be difficult to get your hands on, especially as the company has no plans to sell them in the US. Casio confirmed to TechRadar that the new model will be sold in Europe and Japan. The design features rose gold buttons, a deep blue color bezel and a slightly smaller body than the original watch. It's probably not one for you if you've already bought a WSD-F30, but if can spare 100,000 Japanese yen (around $900, £700 or AU$1275) then you may want to snap up this new look. If that's you, you can expect to be able to buy one in June this year.